America was once a land where everyone was encouraged to seek their fortune - the more prosperous our citizens, the more our whole society could in turn prosper. But leftist forces in the United States have been seeking to tarnish the pursuit of prosperity and to paint profit as an evil motivation fit only for greedy plutocrats. Andrew Puzder understands this first-hand after a progressive smear campaign stopped him from joining President Trump's cabinet. 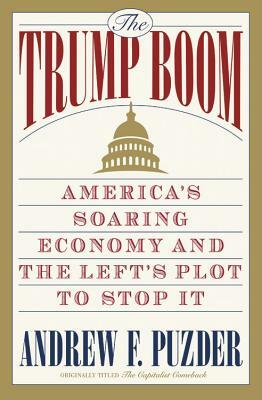 As Puzder explains in his new book, The Capitalist Comeback, this was an act of desperation from a left wing facing irrelevance with a pro-business president in the White House. From its roots in the Progressive Era to labor unions to education to entertainment to its political resurgence with avowed socialist candidates such as Bernie Sanders, Puzder traces the development of the anti-profit forces in the United States and shows how, under President Trump, they can be vanquished for good. ANDREW PUZDER is the former chief executive of CKE Restaurants, where he helped turn Hardee's and Carl's Jr. into the fast food powerhouses that they are today. Starting as the owner's personal attorney in 1991, Puzder helped pull the company out of serious financial difficulties. Under his leadership, CKE has expanded to 3,700 restaurants globally.